There are 24 summits in San Mateo County with an average prominence of 300ft or more. I had slowly collected 2/3 of these over a number of years dating back more than a decade. I was going after these in a slow fashion in part because most of the summits involve poison oak in some concentration, and I would need some time for my body and psyche to recover from the abuse. I was poking around online and noticed that a small handful of Bay Area peakbaggers had finished this collection - Al Sandorff, Andrew Kirmse and David Sanger. I figured it was time to put more work in and did some daytrips to finish it off. David had noticed my progress after the first three days and wrote me an email to give me some beta on the remaining 4 and had uploaded GX tracks to PB to help me. With such genuine encouragement, I went back for a fourth day to finish them off. As before, fog and moisture ruled the day - wet boots & no views. I got up at 4:30a so that once again I could get an early start. This, combined with the 4th of July holiday, was planned to avoid any ranchers who I hoped were taking the day off, or at least the morning. Irish Ridge is found about 5mi south of Half Moon Bay and less than 2mi from the coastline. Of the four, this one caused me the most concern. Al had done this six years ago, choosing to walk right by a residence north of the summit to avoid the poison oak. David and Andrew did Irish Ridge in 2015 with a section they described as "a gnarly brush-choked gully". They tried to return via the house property Al had used, but barking dogs drove them back down through the poison oak-filled gully. Via email, he relayed "there's bad poison oak in the gully but once you get down and up and out it is easy." I was already breaking out in poison oak rashes from the first three days and wasn't relishing more. I did some more studying of the satellite and street views online and came up with an alternate that I thought might work better. The others had all approached from Irish Ridge Rd to the north, making for a fairly short hike. My route from the south would start from the junction of Lobitos Creek Cutoff and Tunitas Creek Rd, and roughly follow the left side of the SE Ridge where it appears to offer an all-grass route. Starting around 6a, I found the route worked quite nicely. There are only a few narrow sections along Lobitos Creek Cutoff to get through the initial wall of impenetrable brush, but once through this the hillside opens up. A doe with fawn looked surprised to see me heading up the steep slopes, watching for a short time before bounding off. The tall grass was tamped down some by deer and cattle but my boots and feet were wet well before I reached the summit. Near the top there are some fences that come together, marking property boundaries. Some cuts in the barbed-wire made it easy to get through and in less than 40min I was at the summit. The top was much as I expected, foggy and flattish and nothing to write home about. The return, I found, was a little trickier because the fog makes it impossible to accurately choose the right direction. With the help of the GPSr I kept close to the original track and got back a little more than an hour after starting. Another 5mi south can be found another minor summit in the way of Pom BM. Stage Rd runs across a small saddle less than half a mile west of the summit. A small turnout can be found to the north of this saddle on the east side of the road. On the west side of the saddle, just off the road, is the Pomponio SB HP, another PB special. Unlike the Half Moon Bay SB HP I visited a few days earlier, this one actually has a recognizable highpoint. I took a few minutes to make my way through mild brush to reach the point before returning to the road to tackle Pom BM. The crux for this one is getting off the road. A wall of heavy brush with an embedded barbed-wire fence is found along the roadway for some distance. I chose to climb the steep embankment where the road cut has left a loose scar because the brush above that looked to be minimal. An animal track rises diagonally from the road to aid the ascent. After that, it was just a matter of following the slope and GPSr through the fog and grass to find my way to the summit where the benchmark is located. Once again, the GPSr was quite useful to find my way back down the correct route to return to the road. The last two summits are located on Penninsula Open Space Trust (POST) lands that are leased out for cattle grazing. Both are signed for No Trespassing. There is nowhere to park at the gate leading to Peak 576ft off Cloverdale Rd, but one can find a wide turnout halfway between the gate and the entrance to Butano State Park. This was the longest hike of the day, about 2.5mi each way and also the most picturesque. Ranch roads lead from the pavement all the way to the summit, going by the pretty Reservoir de los Frijoles (Hollow Bean Lakes). Just upstream from the higher lake is a beautiful wetlands with forested slopes in the background enhanced by the fog drifting among the treetops. Tall reeds line the wetlands and road, most now going to seed. Many birds can be heard and seen throughout the area. 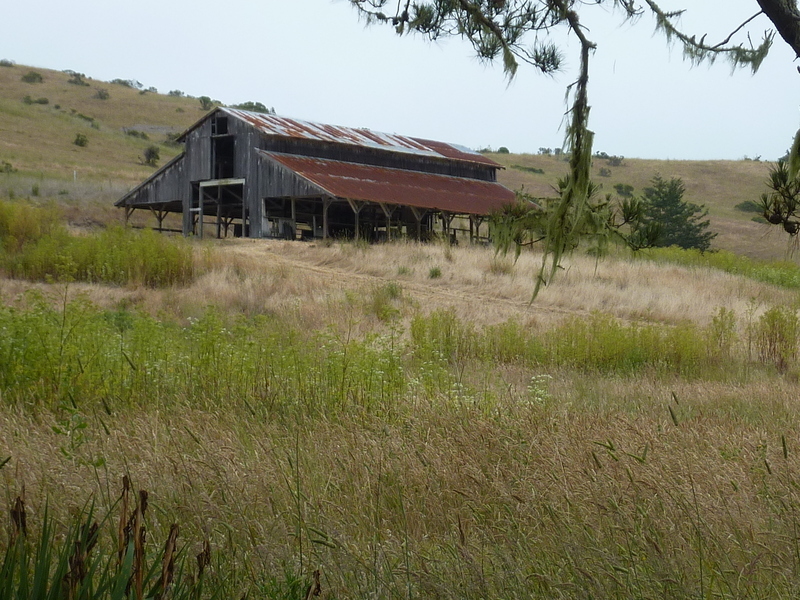 Just north of the wetlands is a large, old barn still used by the leasee. At another location a small pond can be found with a small solar panel - perhaps for a wildlife camera? After passing through a series of gates, one branch of the road eventually winds its way up to the summit amidst more fog. The top features a half dozen green water tanks enclosed by a fence, making for another somewhat disappointing finish. My return followed the same route and after two hours I was happy to get back to the start without finding another soul in the area. I know, there are 58 CA counties. But Sacramento County has no summits with 300ft of prominence - a county freebie, as it were.